Fuzzy Fruits, originally uploaded by punquin. What kind of tree is this in our backyard? It has little fuzzy fruits. Have you taken one of 'em and sliced 'em open?? Are they ripe yet? If they're not ripe, I guess it could be an apricot or a peach... if they are, I have no idea... never seen a fruit like that! Looks like a peach tree- at least that's sorta what my peach tree looks like. 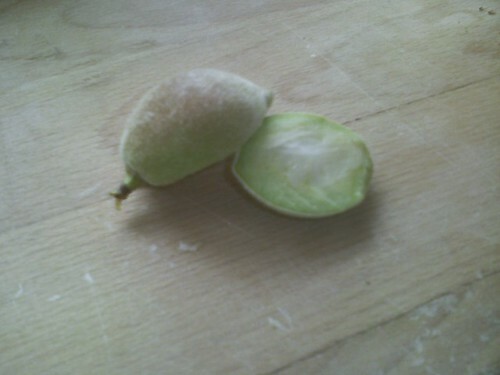 The fruits are about the same size as that now, too. They get bigger and riper and ready to eat in a month or two if I remember correctly. Of course it could be something else, I'm not much of a gardener. ... it's a peach tree. 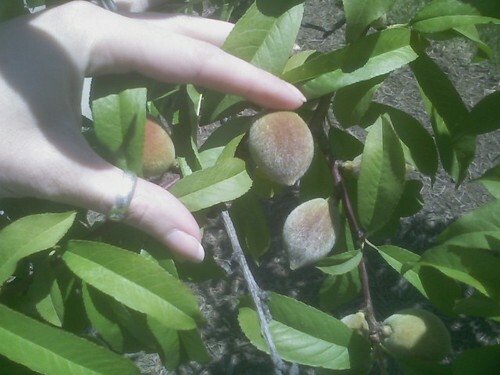 I'm not absolutely sure, but a search at google turned up some pictures of non-ripe peaches in their tree, and they(and the leafs of the tree) look very similar to what's to see in your picture. They look figgy to me. Fig. Fig. Go Figure. Or maybe a pre-seed kiwi. ... No. 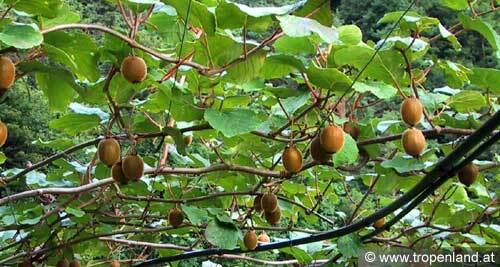 Kiwi-bushes have huge roundish and crumbly looking leafs. But that the in the second picture posted opened fruit seems to have no stone, is confusing me with my previous "Peach"-theory, too(even when the tree's leafs would match to peaches). You could clone splice a edible flowering branches onto your tree to grow more edible ones, or you might just not be watering/nutrients enough for the fruit production, or something.